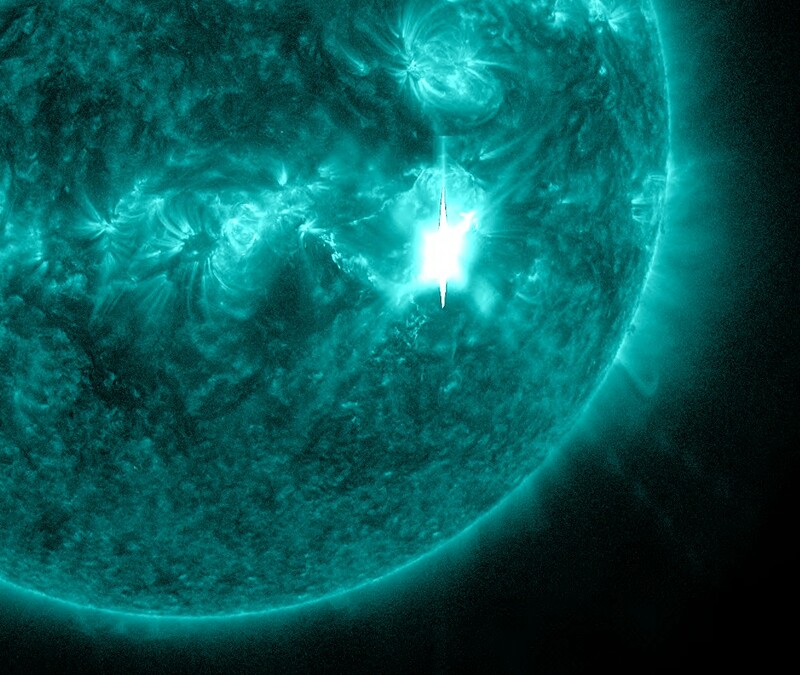 A moderately strong solar flare measuring M7.3 was observed around region 2036 on Friday morning peaking at 13:03 UTC. 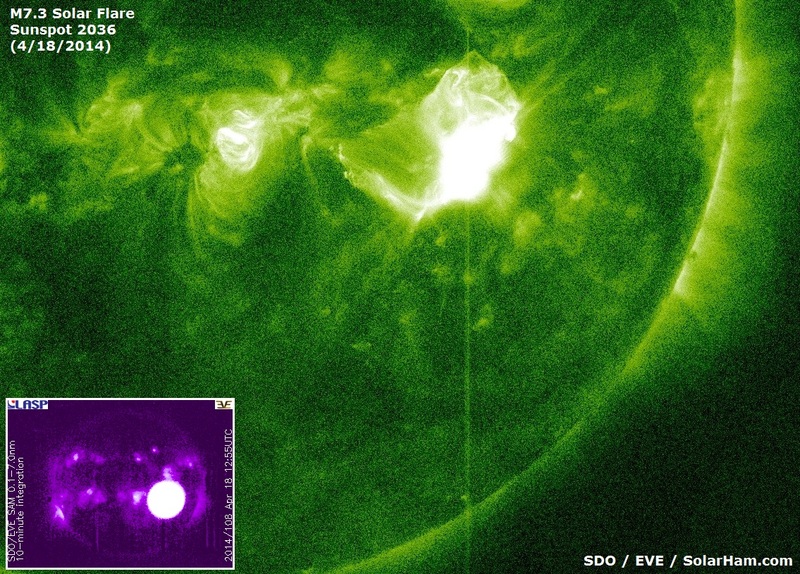 A 10cm Radio Burst (TenFlare) measuring 1000 sfu and lasting 24 minutes was associated with the event. 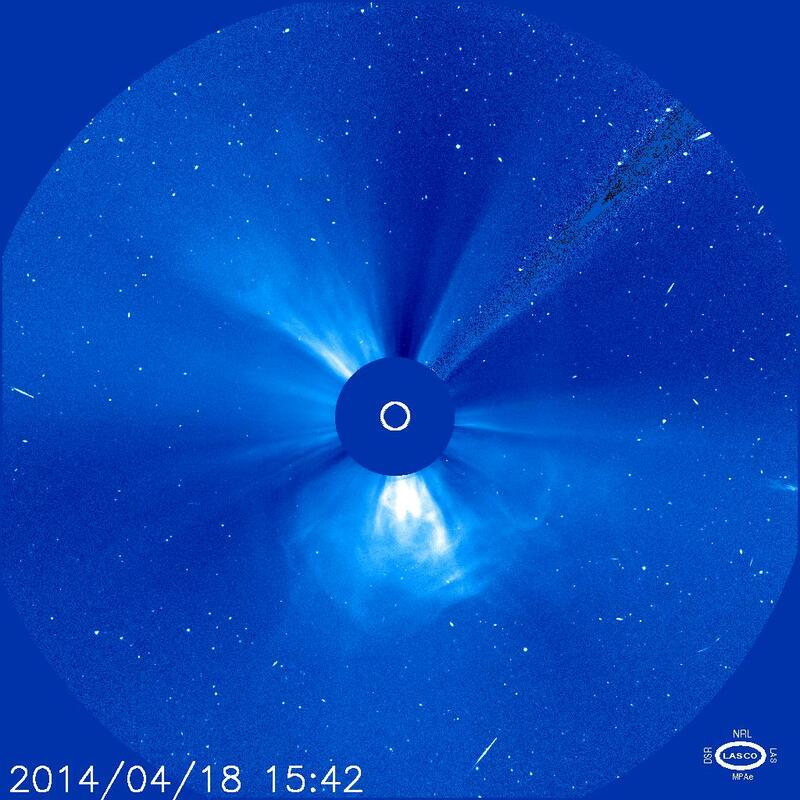 The flare itself was long in duration and a halo coronal mass ejection (CME) became visible soon after in both STEREO Ahead COR2 and LASCO C3 imagery. There does appear to be somewhat of an Earth directed component. More to follow. Ground based magnetometers are now detecting a deviation in ground current and this signals the passage of an incoming coronal mass ejection (CME) past our planet. Solar wind speeds as measured by the ACE Spacecraft also increased to near 700 km/s, the same speed originally predicted by the WSA-Enlil Solar Wind model. The Bz component of the interplanetary magnetic field (IMF) is pointing north, however it could eventually begin to point south in the wake of an impact. Stay tuned for the latest updates. The WSA-Enlil Solar Wind Prediction model released by NOAA/SWPC has been brought up to date to include the halo CME from this morning. 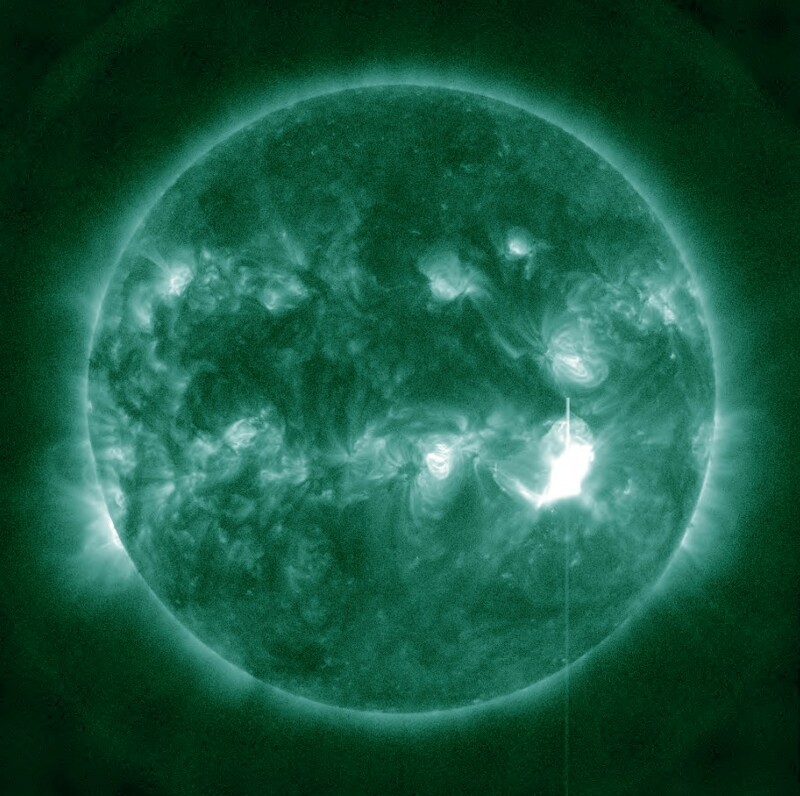 They are predicting an impact by midday April 20 UTC time with a solar wind increase to near 700 km/s. More updates to come this weekend. 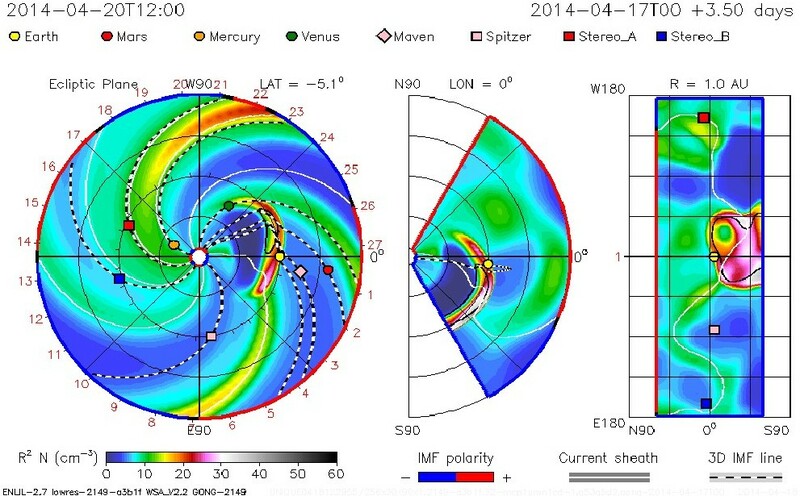 An initial tracking model released by the Goddard Space Flight Center is calling for the M7/CME event to sweep past our planet by April 20th. Please note that this is very preliminary and updated modelling will be released during the next 24 hours. Geomagnetic storming may be possible once the cloud impacts our geomagnetic field within 48-72 hours. Sweep Frequency Event data now availale. 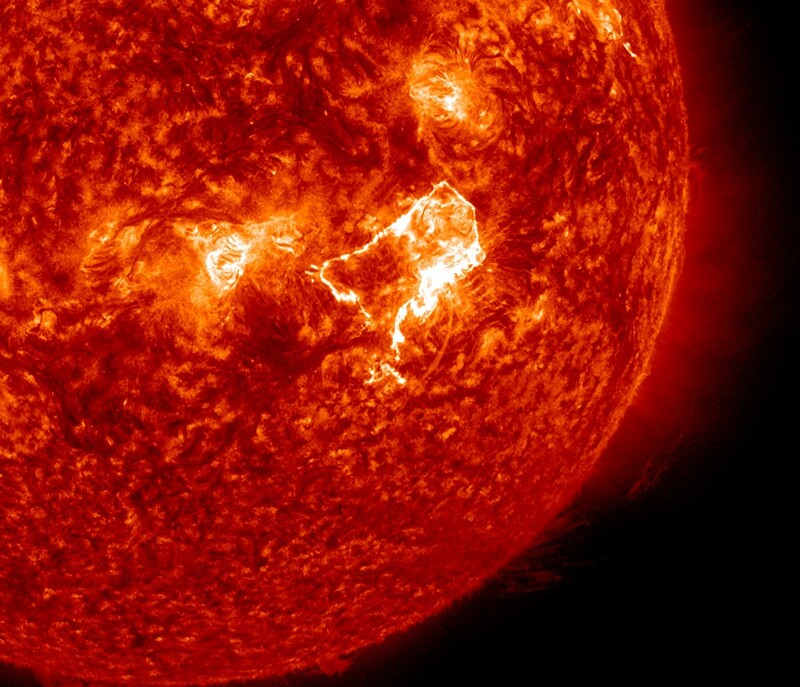 The M7.3 flare generated a Type II Radio Emission with an estimated velocity of 851 km/s. A Type IV emission also associated. This data goes hand in hand with the CME mentioned earlier. 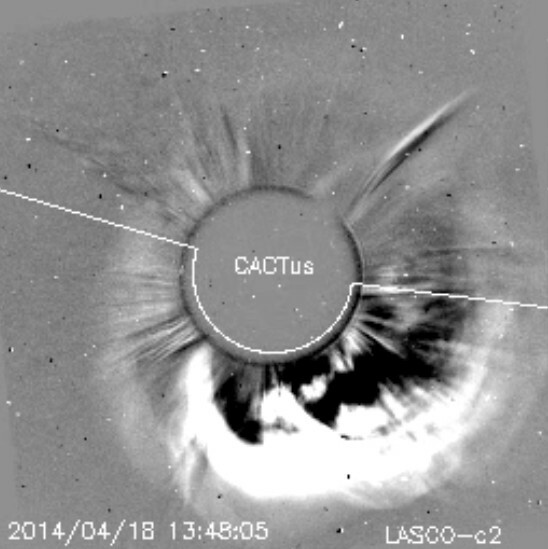 A couple of new images are now available by LASCO C3 and they do indicate a halo CME with an Earth directed component. The larger bulk of plasma was directed south of the ecliptic, however there does appear to be weaker component directed our way. More updates to follow once additional imagery and modelling becomes available. 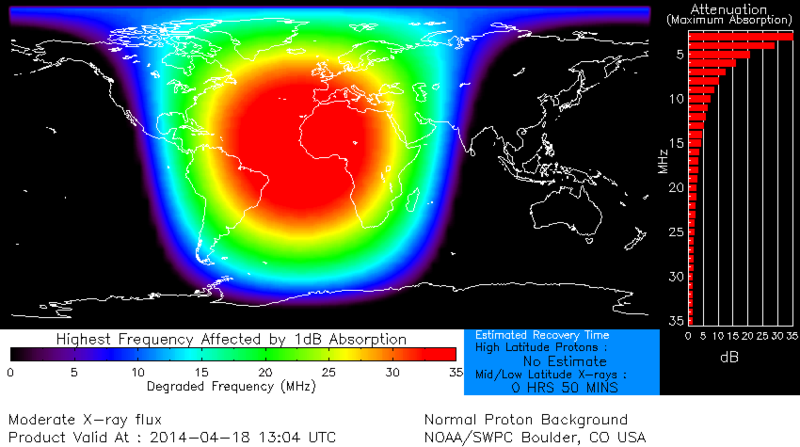 Energetic proton levels continue to rise and a minor S1 radiation storm is now in progress. 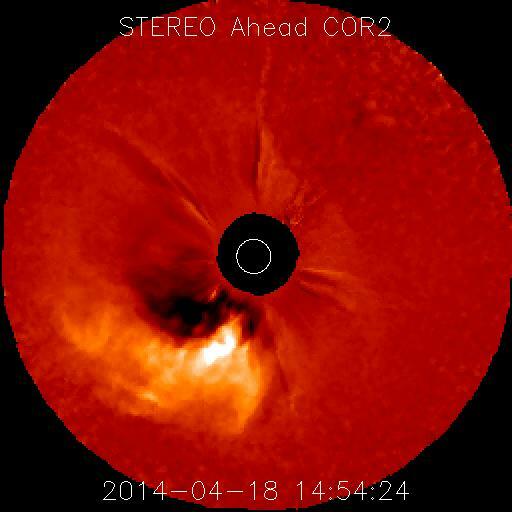 Updated coronagraph imagery by STEREO Ahead suggests the CME is full halo with a partial Earth directed component. More updates to follow once Earth facing LASCO imagery is available. Video of the event now available. Minor (S1) radiation storm watch issued by NOAA/SWPC. Energetic proton levels streaming past Earth are now on the rise. AIA video of the event is now available. Located at the bottom right of this page. 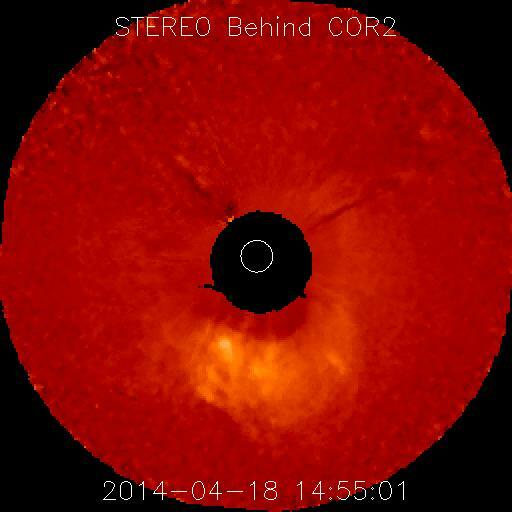 A Coronal Mass Ejection (CME) is now becoming visible in the latest STEREO Ahead COR2 imagery. 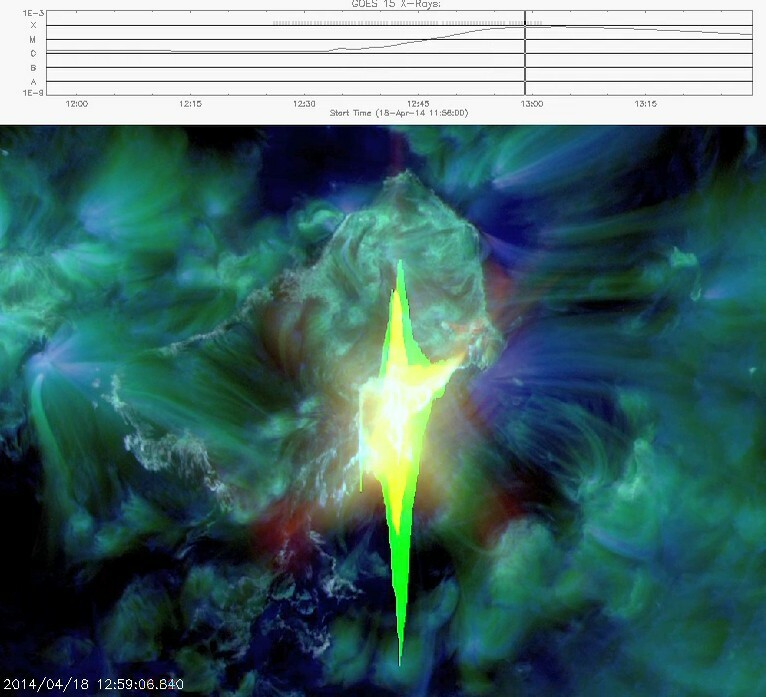 A 10cm Radio Burst (TenFlare) measuring 1000 solar flux units (sfu) and lasting 24 minutes was associated with the flare event. 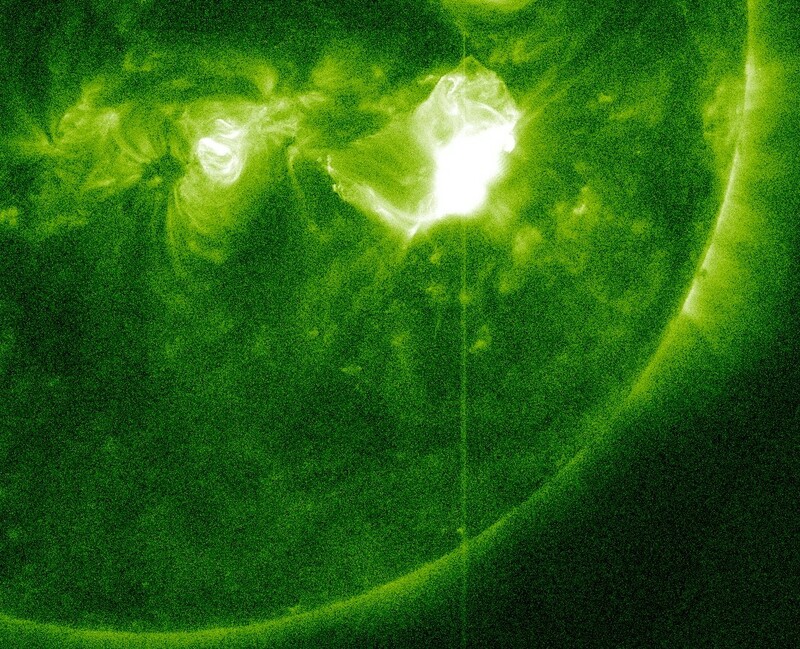 A moderately strong solar flare measuring M7.3 was just observed around region 2036 peaking at 13:03 UTC. Remains in progress at this time. Stay tuned for the latest updates.